When I first heard about Marvel’s re-launch of the Moon Knight solo, I was not immediately frothing at the mouth, given that I was largely unfamiliar with the character. Reading a little closer, I noticed the names attached; Warren Ellis, Declan Shalvey and Jordie Bellaire. Shalvey and Bellaire were just coming off a great run on Deadpool’s “The Good, The Bad And The Ugly” arc. Shalvey also worked on Venom with Cullen Bunn, which I deeply love. Eisner-award-winning colourist Jordie Bellaire colours about 80% of my favourite books. So Moon Knight’s potential was already looking up. And then I realised I hadn’t read any new Warren Ellis stuff in a good while. I mean, definitely, I had reread FreakAngels earlier in the year because when do I not want to be reading FreakAngels? I just hadn’t read anything fresh off the assembly-line new. Suddenly, there was a little bit of excitement building for the book. It helped that my local comic book shop was doing a signing, just for the added poke in the right direction. Given that Moon Knight himself has such a distinctive look, it seems only appropriate that the artwork itself would be so meticulous and engrossing. His runs on Venom and Deadpool certainly showed me that Declan Shalvey does creepy well, but the artwork he’s produced on these six issues of Moon Knight are a level above. Added to that, the scrupulous attention to detail in Jordie Bellaire’s colours and you have a dream-team book. 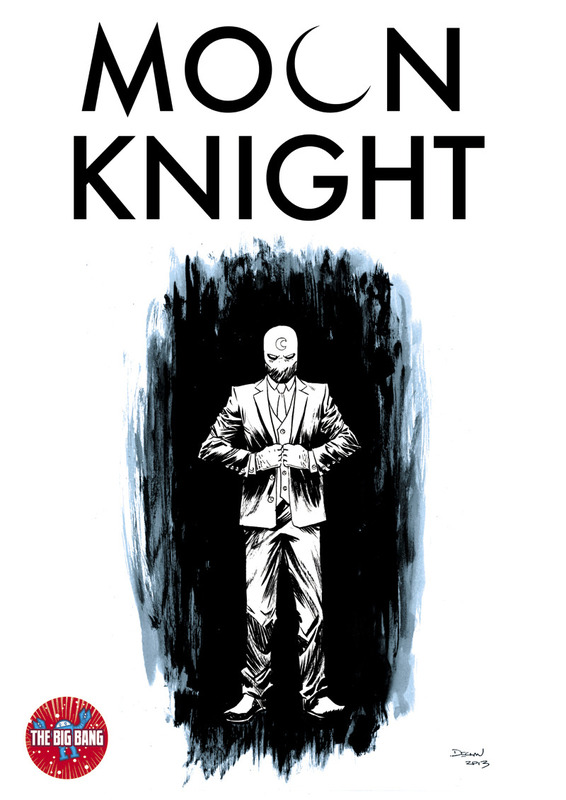 The decision to keep Moon Knight himself uncoloured is inspired, granting a visceral contrast between Moon Knight and the world he stalks through. It is particularly effective when the Moon Knight mask is removed and the “real” face of Spektor sits imposed above the ethereal suit. There is a fantastic moment where Moon Knight enters the den of the murder, you seen a throwing-moon in his hand, and then it is gone with a small, innocuous movement line on the page. Some fourteen panels later, the pay-off comes, when Moon Knight informs the villain, “I killed you two minutes ago. Look down.” You can find the little blade peeking out of the bad guy’s side in two panels before the reveal, not buried by any stretch, but carefully placed within the context of overtly detailed shots examining the broken, ravaged physique of the ex-soldier antagonist. The second issue, “Sniper”, is where we begin to see that this run is something unexpected. It is also the issue where you begin to feel like Warren Ellis might actually just be trying to slowly destroy Shalvey’s mind. It opens with an eight-panel grid, ending in a headshot. Next page only has seven panels, with another red-splashed kill-shot. Every turn of the page has another victim and one less panel, until there is the one page, one panel, red-splattered, exploding exit wound of the final headshot. It is a testament either to his intention to crush their spirits or to his trust in the team that Warren gives the seven pages which succeed this only one dialogue bubble. Between them, Shalvey and Bellaire are perfectly capable of carrying off the action and the storytelling without the crutch of text boxes everywhere to carry the audience. This is something they return to later in the fifth issue, “Scarlet”, where Moon Knight ascends a building to rescue a young girl. It is an issue essentially devoid of dialogue, bar a couple of key scenes. Most of the issue however, is driven by Moon Knight beating the crap out of people, counting the floors as he climbs. It, again, reinforces the central theme that Moon Knight is the divine vengeance (what the ancient Greeks referred to as nemesis) visited on those who would attack overnight travellers. The metaphysical framework of any fantastical story tends to attract me; it is part of the reason I respond to the kind of stories of Stephen King, Neil Gaiman and Hal Duncan so particularly. Moon Knight draws deeply, but sparingly, on its own foundational myths. ”Box”, the third issue is perhaps the most expansive in terms of the mythological basis of Moon Knight as he takes on a band of ghost-punks who have been terrorising a small section of New York. Initially defeated (or rather, battered bloody) by the ghosts, Spektor sits in his home in sullen consultation with his other aspects. The grim, suited, bird-skeleton that represents Khonshu reminds him of the Egyptian fascination with the dead, points him towards artefacts he doesn’t even really remember buying. It is another hint at the lack of agency devolved to Spektor himself, further confirmation that Khonshu, and Moon Knight, have more dominance than might be suspected. Mystically armoured in ancient bones, the ghosts represent significantly less threat. And yet, Ellis doesn’t leave the story at that. Much like the previous issues, the audience are left mulling over the melancholy victimhood of Moon Knight’s antagonists. Certainly, they are rarely sympathetic, but there is some aspect of their story that we empathise with; we are left to contemplate the tragedy of that life, to consider what, if anything he deserves from us. Certainly, Moon Knight does not care. He only came to silence the ghosts, and achieving that, leaves their bones behind. He is, quite frankly, not a heroic character. He is a force, an agent. He does not do the things were necessary expect from our idols. He does not bury the bones, or lament the dead, he does not judge guilt or worth. He does save little girls. He saves them when it is his purpose, when divine laws of natural human interaction has been breached. He is not a crime-fighter, he is the punishment of a wronged God. My personal favourite issue is the fourth, “Sleep”. Ironically enough, it was probably a nightmare to draw and colour. Just look at that gorgeous monstrosity there. What even? The imagery that Shalvey and Bellaire provide has an epic grandeur to it, matched only by the detail in it. In fact, it is almost as if the detail of the art exists in utter counterpoint to the minimalism of the dialogue. The combination paints a character who is laconic, while emphasising the Holmesian attention to detail in his detective aspect. He is a watcher, an agent of observation, as much as a vehicle of violence and vengeance, if only because he must see where to point himself, before unleashing. 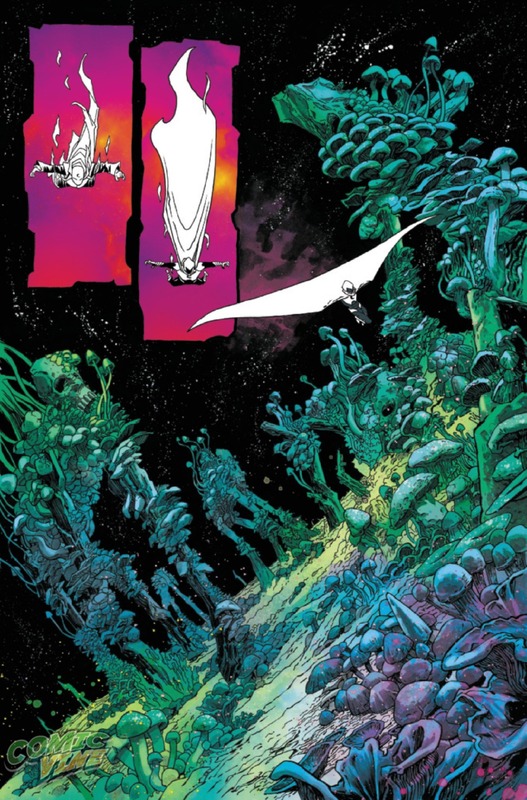 It seems almost a counter point to the urgent accusation levelled by Moon Knight, raging, “You’ve been breathing in his dreams.” Certainly, much of this is baggage and iconography I am bringing to the table, but any art is at least half audience participation. 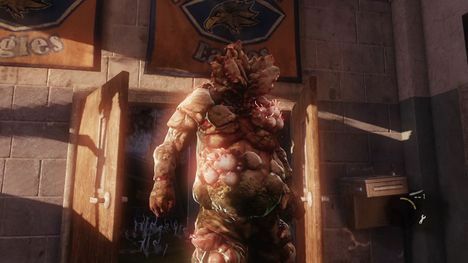 There are those who will never be able to think of mushrooms with considering Cordyceps-zombies and the Last Of Us. In a sense, what the issue plucks out of me is what I like best about it. Comics as medium is always working with shorthand, with a range of twenty-pages or so to tell a story, it almost certainly relies on the reader to provide some of the substance; the gross foetor stench of mould or head-ringing dizziness of a head-punch, we do not need every aspect of a scene described, only to have our thoughts directed to it. The purpose of this run, it seems to me, is to tell you who Moon Knight is. It is not so much a continuing adventure of, but rather an attempt to create a holotype example of the Moon Knight character and his mythos. It serves as a defining piece of mythology, six vignettes which set out that stall so to speak, giving us glimpses of the wider story, but plucking the most essential parts and reinforcing them, refining the Moon Knight archetype and laying it out for the audience, both new and old. I firmly believe that this is a book which will serve as the creative touchstone for future incarnations of the character, as well as for new readers who come to character. When people ask, who is that guy, people will point to this run for the answer. Interestingly, not long after the new comic’s release, Captain America: The Winter Soldier, dropped a “man from Cairo” reference, that has led many to suspect it will be part of the Phase Three releases that lead up to the third Avenger’s film. Given the success of The Guardians Of The Galaxy in its first week, and that a Doctor Strange film is in the works, it does not seem impossible that Marvel could go with Moon Knight at some stage. Although, and I mean this quite sincerely, if the next film announcement from Marvel is not a female-led piece I am likely to lose my patience completely. They have made ten films, with three more in various stages of production, all of which have essentially been headlined by straight white men; it is very much past time to make one with a female in the lead. I still have my hopes pinned on either a Black Widow or Captain Marvel film (or both), but there are plenty of other characters for them to work with. That said, if a Moon Knight picture ever does come to fruition, the Ellis/Shalvey/Bellaire run will serve as a great introduction to the character for anyone who (like me) likes to get a little look at the source material before seeing the film. For anyone else who is also sad to see the team go, there was good news out of the Image Expo a few weeks ago. While they won’t be working on Moon Knight, they will be launching a creator-owned book Injection in 2015. The Moon Knight trade paperback will also be available from all good comic book shops come October, and it will absolutely be getting pride of place in the over-stacked, bulging monstrosity that is my comic’s bookcase.